Thank you! I've been waiting for the map a list feature for a long time! With this release, we have made some continued updates to the Lists hub on Geocaching.com. 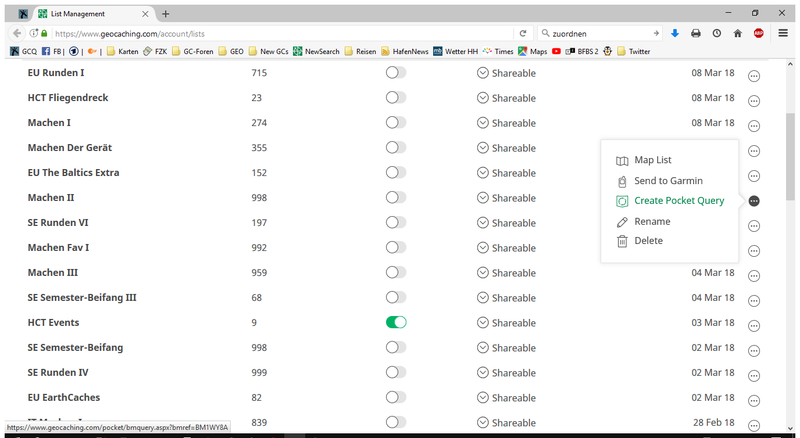 Aside from visual updates to the page, Premium members can now make a copy of any of their owned Lists on Geocaching.com. Once a list is copied, you can access it from both the Geocaching® app and website. Lists you own can be found on your Dashboard under "Your lists" on the left side menu. Nice work! I like the addition of mapping a list, and the lack of ability to create a new list was a glaring omission that had been confusing folks for a while. I looked for the "copy" function, but don't see it. It also isn't shown in the screenshot in the OP. Did that function maybe not make it into this release? I see that the sorting order still isn't sticky. Always defaulting to "last modified" simply doesn't fit my needs, because it makes finding a particular list difficult (which is 99% of my use of this page). I'd greatly appreciate it if you could make our preferred sorting sticky so I can have the page sort my lists alphabetically. If this issue could be resolved, I'd happily start using the new Lists page rather than always having to switch back to the old one. The Copy List feature is only available on the detail page because we wanted to allow players the ability to copy lists from other players as well as your own. Okay, I see it now. This might be confusing for people, though, because it's a function that many would probably expect to be available alongside the other options on the Lists page like Share, Rename, and Delete. I just tried the Copy button on one of my lists, and all it did was show me the same list again, but without the description displayed. I say it's the same list and not a copy because there aren't any new lists showing on my Lists page, either with the same name or "Copy of foo". It's pretty difficult to assign the hamburger menu to the corresponding Bookmark List. It's way to far to the right. - Place the hamburger menu column to the first column next to the BM's name. - Create a column next to the BM's name with a map icon (like on the PQ list page). - Slightly darken the BM row by 10-15 % when hovering the hamburger menu. The Copy List update was added about 1 month ago to allow player's to copy another player's list. In that situation it only made sense to display the Copy button on the detail page. I agree with you that copying your own list could make sense from the list hub. At this point all of the logic for copying a list was included in the detail page so it was relatively easy to allow players to copy their own list from the detail page. There are additional considerations to allow copying a list on the list hub which we were not able to accommodate in this iteration. When you copy a list all of the geocaches on the list and the comments for the lists are added to a new list of the same name and you are redirected to the detail page of your new list. Notifications are disabled and the status is set to private by default. If you refresh your list hub you should see the new list at the top. I had been refreshing my Lists page and hadn't seen any new lists there in two different browsers, but I just refreshed once more and now I see a bunch of new ones. It's a dynamically-loading page and I saw the same thing in separate browsers on different computers, so I wouldn't think that browser caching would be the issue. Maybe it was just really slow to reflect the new lists? Is it intentional that the list's description doesn't get copied? I think this was mentioned as an issue when copying others' lists too. The description can sometimes be as important as the content of the list. For example, if I'm keeping a list for a challenge cache, I often track the requirements and what I still need to do in the description, or details of how I've met the requirements of the challenge. I hope the description isn't being phased out, because I expect it's pretty widely used. I tried to map one of my lists, and it just shows the normal map, with all caches, centered on my home coordinates. Edit: the list I tried to map consists of only archived caches, guess that's why this happened. Tried a different list, and that worked. Will we get a "Bookmark Lists" button within the Geocaching Map as well? That would be very handy. I also would like to see the default order of the lists to be alphabetical as I have quite a few of them and know the name but not necessarily when I have been using it the last time. So now I either need to go throught the whole list of lists or redo the ordering twice. Mapping feature: Nice, but why isn't it using the standard map? If I then clear the search filter it loads the normal one. Up until recently (this change?) The my lists page would show how many finds you had on each list, that is nolonged displayed. Please put that feature back, it was very useful. ...So now I either need to go throught the whole list of lists or redo the ordering twice. This is another issue. If the default sorting is going to remain enforced on the "Last modified" column, the re-sorting order needs to be fixed. Currently, if you click once on the "List name" heading, it sorts in descending order (ie. Z-A), so you have to click it twice to get to what most users would want. The most logical initial sorting order for a text field would be ascending (ie. A-Z). One for the wish list -> to be able to create a list from the map directly, similar to what can be done on the app. It is possible to add an individual geocache to either an existing list or to a newly created list from the map by clicking on a map pin and then "Add to list". Is this similar to what you are looking for? Please fix the sort order! I click on the list name to get it into alphabetical order, but every time I return to the list, it ends up with the most recently viewed lists at the top. I just want it STAY in alphabetical order A - Z. No, not quite. What I want to be able to do, is say search for a small town, display caches around that town on the map and then be able to add all the caches on the map to a list (as can be done on the app) without having to use the PQ interface. Then I could save the list offline for offline caching in the area which may not have good mobile coverage.